How to re-wrap a set of driftboat oars. 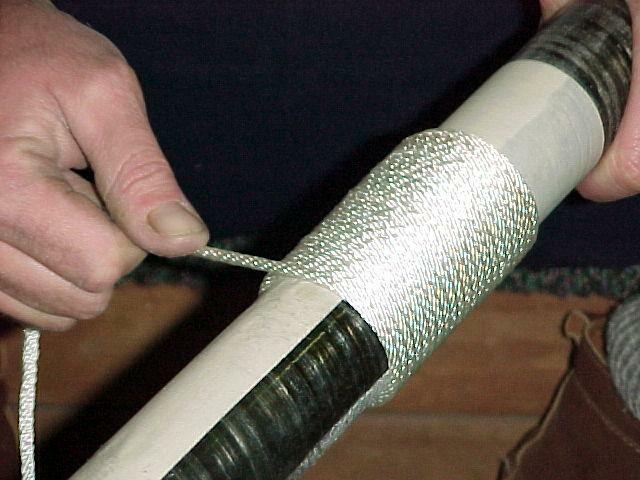 With the upcoming fall salmon and winter steelhead fisheries just around the corner, a number of anglers will find that the current rope wraps they have on their boat oars are getting quite worn as they prepare their boats for the upcoming seasons. 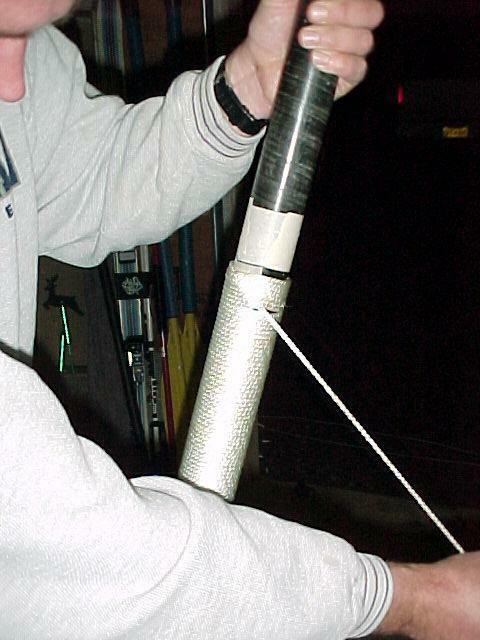 Rowing with damaged wraps can lead to damage to the oar shaft which can result in failure of the oar at a most inopportune time. Below, you can find a detailed set of instructions and photos to rewrap your oars and prevent any damage to your oarshafts. Each step is accompanied by a small picture; to enlarge any of the pictures, simply click on it and a larger version will open in a new browser window to give you a clearer look. 80-120 feet (depending upon length of wraps) of 3/16" nylon rope. Some people use 1/8" but most use 3/16". 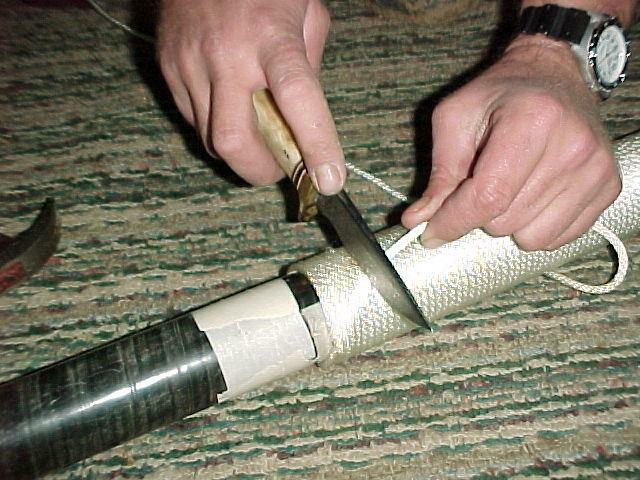 Begin the process by marking where your current wraps start and finish on the oarshaft by marking the oar with a complete wrap of masking tape butting up against each end of the wrap. You can modify the placement and / or length if you need to, but most wraps should already be located in the proper position. 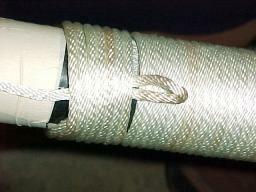 Now, cut through the old wrap at one end and begin unraveling the old rope from the oarshaft. 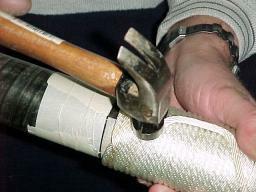 If you have oars with removable blades, you will find it much easier to do this and the remaining steps with the blades removed. 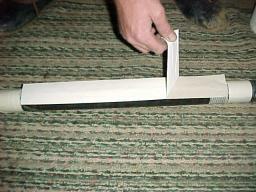 Now, place a strip of doubleback tape along the length of the oar between your marks. 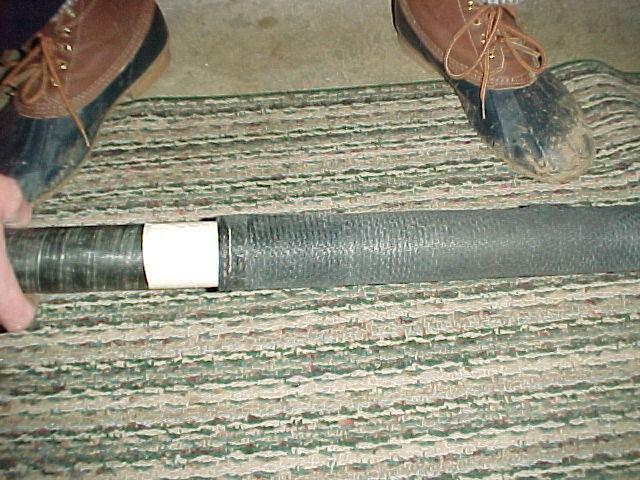 This is a wide tape used for golf club regripping that I am using here, usually most people are only able to find narrower strips in which case put a few strips along the circumference of the shaft. 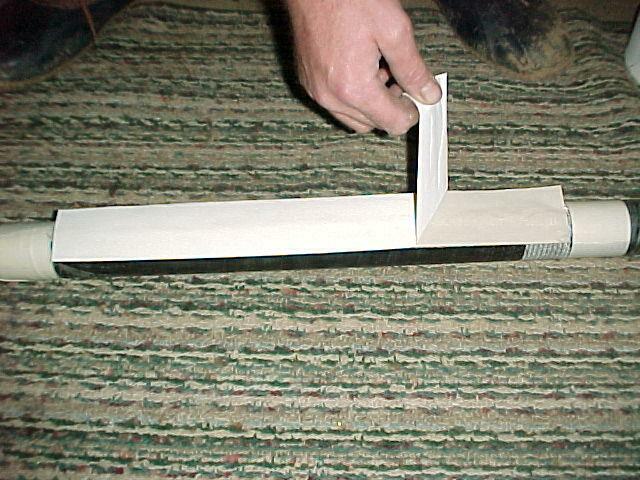 Remove the tape backing to expose the adhesive. 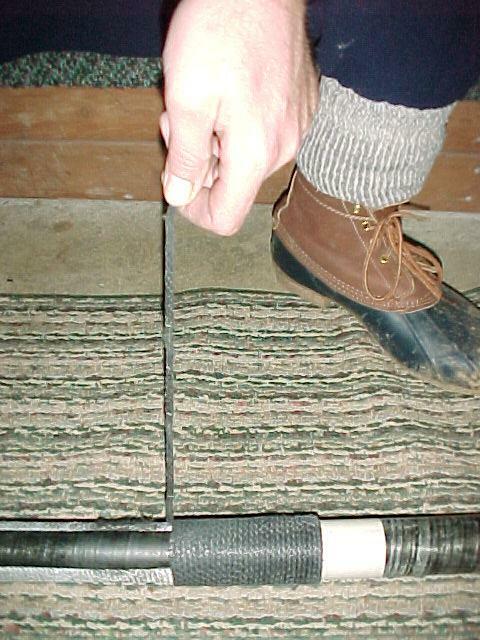 Take a small flathead screwdriver or larger nail and unravel the strands of the rope for about three to four inches of its length. 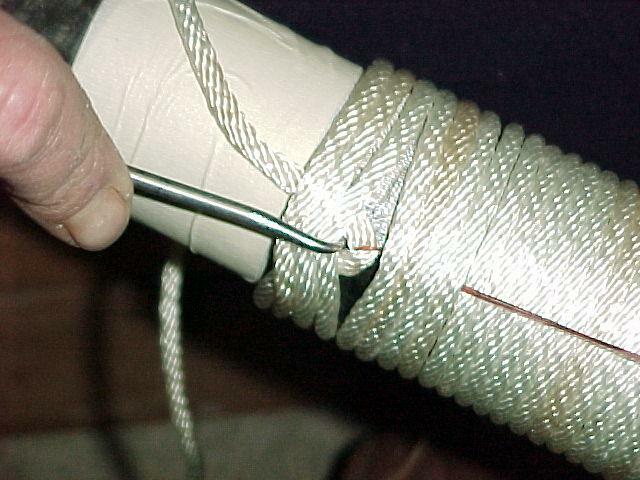 Make sure to do this completely or you will have a lump in your finished wrap. 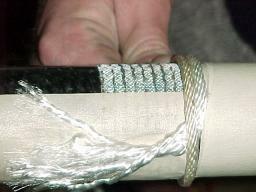 The next step is to lay the rope as shown to the left at what will be the TOP (closest to the handle) part of your wrapping. 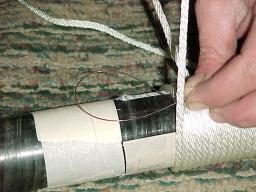 Begin wrapping the rope around the shaft, beginning near your start point marked by masking tape. The first few wraps are a little tough to get started, but once you get the first ones in place, things will be a breeze! 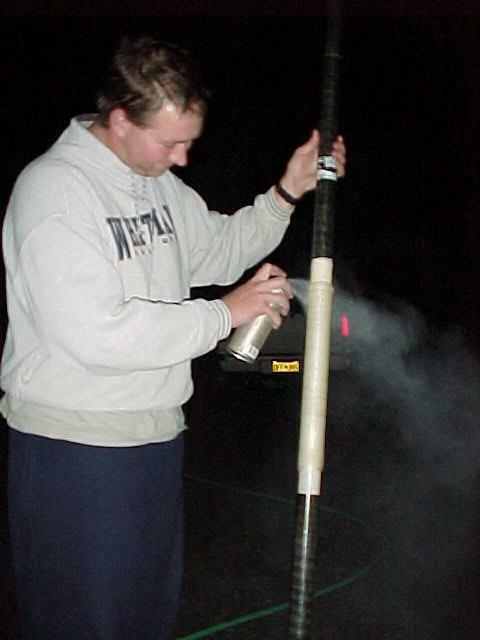 Continue making wraps down the length of the shaft. Make sure to nestle each warp snugly against the one above it and pull very tight against the shaft. 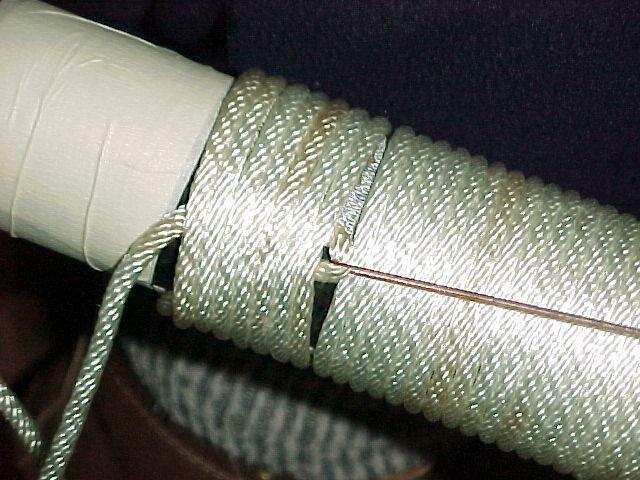 This step takes some time and lots of rope, so be prepared! 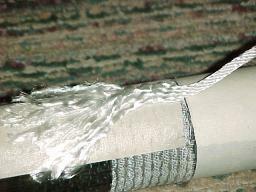 When you get to the point where you have about 2 1/2 inches of wrapping left to do, insert a loop of very heavy monofilament line under a wrap. Place the loop end toward the bottom of the oar and the tag ends toward the top. 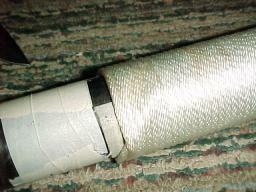 Leaving a small gap between the wraps without mono underneath and the the one that does, begin wrapping the shaft again. 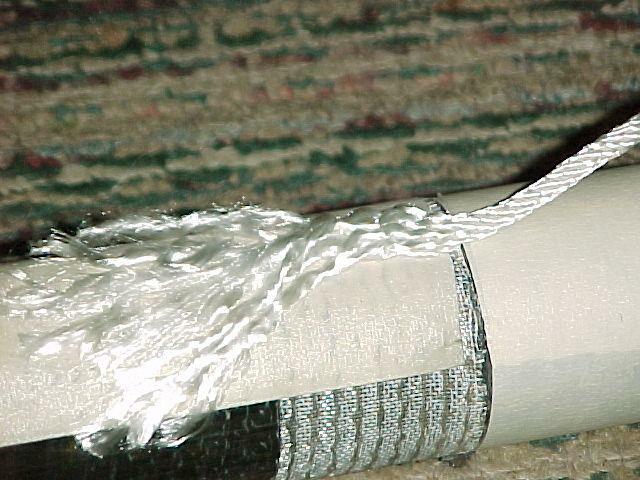 In these final wraps, keep them against one another, but don't pull them quite as tight as you were previously making them on the wraps earlier in the process. Continue wrapping until you get to the point on the shaft which you marked earlier as your finish point. 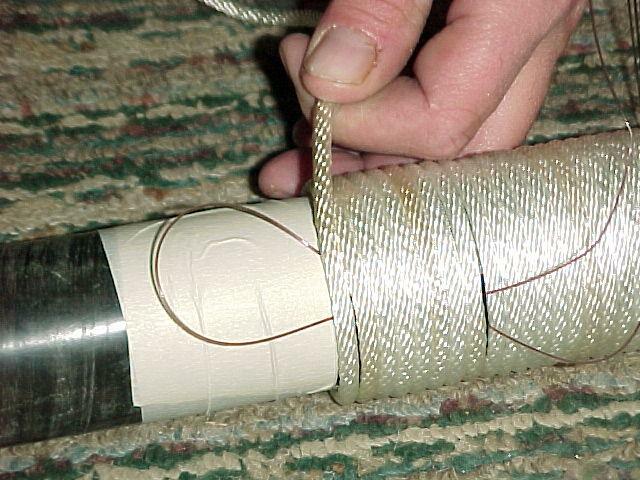 Now, cut your rope about two feet from the last wrap on the oar and place this tag end through the loop of monofilament. 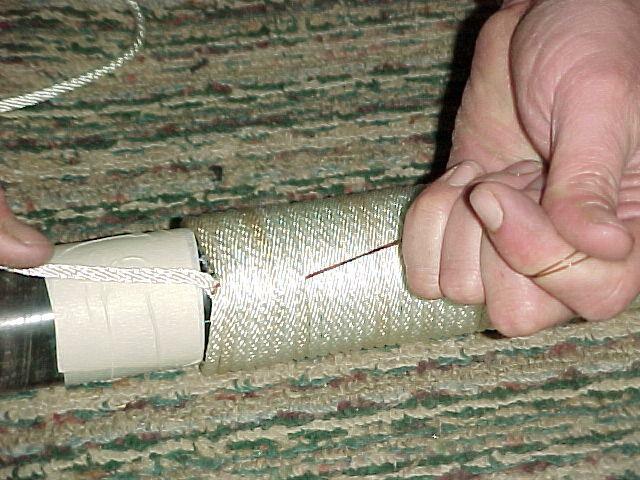 Your next step is to pull the mono back toward the top of the oar pulling this tag end of rope you created in the last step underneath the wraps already in place. 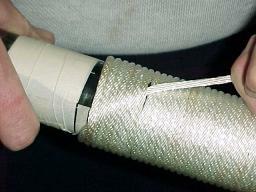 Depending upon just how tight you made your wraps, you may have to use a hook of some sort or perhaps a screwdriver to lift each wrap up and over the line that you are pulling up the length of the shaft. Keep working this loop of rope up the shaft under the rope wraps until it pulls clear of the wraps of rope. Remove the monofilament from the loop of rope and pull the loose end of rope all the way through from underneath the wraps. 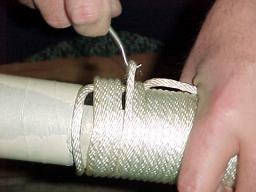 Use the wire twisting hook or something similar to pull each wrap as snug as you get it; starting from the uppermost wrap down toward the bottom of the oar. Pull your tag end tight and try to work all wraps as close together as possible. Your next step is to take a hammer and pound gently on the hump you have over the rope underneath the wraps to try to flatten it out as much as possible. Now place the oar on the ground with the grip portion in the air. 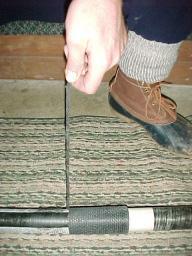 Pull the tag end of line as just tightly as you can ... use all your weight if possible. 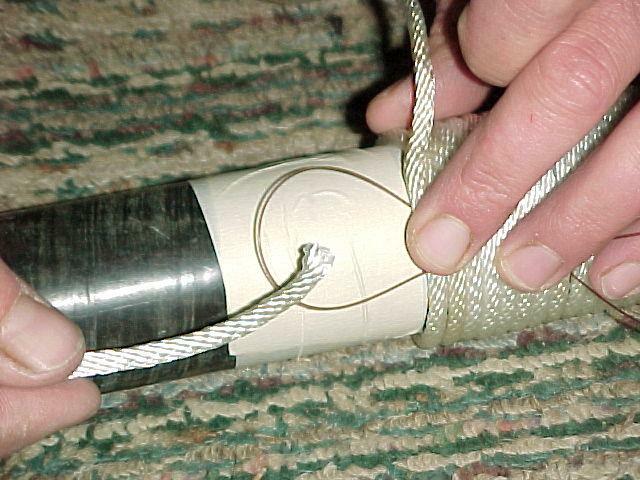 Now, you lay the oar flat on the ground again and with a sharp knife, carefully cut the tag end of line off inbetween the wraps. 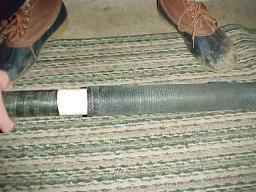 The wrap is finished, this is how the finished product should look if done correctly. Now for the finishing touches. That's all there is to it! Depending upon how much you row, this ought to last you for years. Where did I learn to do this?? 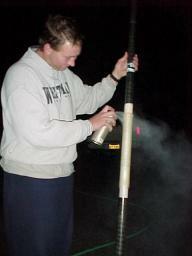 Refinishing golf clubs, this is how you rewhip a persimmon headed wood. So if you ever need to do that, you'll have the ability to do that as well. As always, good fishing!